Valentine’s Day is for Good-Smelling Hair ! I don’t necessarily “love” or “hate” Valentines Day… I’ve never wanted to make a big deal about it when in a relationship, but at the same time, still feel a bit left out if I am not busy on the evening of February 14! I think no blonde ever wants to be LEFT OUT! Hello! Aren’t we supposed to be the center of attention!? That being said….. Here’s a little secret product that can make anyone swoon when their face is close to your hair, whether it’s tonight or next week. Oribé Hair Refresher. From Oribé’s ridiculously AMAZING smelling line of hair care products, this little gem is small enough to carry with you, and as promised, will “refresh” your flaxen mane with a light scent that you will become quickly addicted to. (Also, this is actually affordable in comparison to some of the other products he makes…not that they aren’t all TOTALLY worth it). No one can resist the scent of this luxury hair refresher. Not even Superman or Wonder Woman. 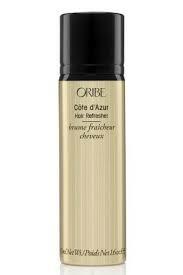 The entire line of Oribé is so amazing, so I promise to soon dedicate an entire post just about my favorites! Happy Valentines, ladies! And don’t forget; whether you have found someone worthy enough to be”your valentine” or not, let us all remember that Cupid DOES have blonde hair, so it’s kind of “our” holiday anyways! I mean, what do you want? St. Patrick’s Day? EW! Love and Arrows and Red Bows in Blonde Hair!